I used to be the girl who only ran when she was being chased. I started running after a good friend inspired me to try a 10K trail run. Looking back I guess I should have started with a 5K, but I am also an overachiever. With just 2 short weeks I to train I pulled out some sneakers with a trace of tread left on them and started running laps in my neighborhood. Once I realized running was fun, and had a bunch of great side benefits like getting me back into my skinny jeans and the adrenaline super highs that come after a good long run, there was no turning back. I went from skinny jean runner to running because it meant I could work on my Flying Saucer plate and not worry about the calories it takes to consume 3 beers in one sitting. Now I run because it truly makes me feel incredible. I run because it makes me feel strong and confident and I feel like I can take on anything. There’s nothing like running through your neighborhood at the crack of dawn singing along to Bad Religion's "Sorrow" as loud as you can.Your neighbors will thank you for being such an awesome role model and motivating them to get out of bed early and run too. Even better, add the Nike+ chip to your Nano or iPhone set up. Their interface is a motivation tool in itself, and will help you track your distance and speed in real time while you listen to your favorite tunes. Cotton is not your friend when you are running. Socks especially. I love my Injinji Toe Socks and can't imagine running without them. You don’t need a huge running wardrobe – just a few key items can make running more comfortable. A good running bra is also key for us girls. I went through at least a dozen before falling in love with the Victoria Secret Ipex Bra. 5. Peer Pressure is Good. mmmKay? Humans are social creatures. We tend to pick up on the habits of our peers. The more you hang out with runners, talk about running, think about running, the more excited you’ll become about running.That peer pressure motivation will keep you going even on days you don't quite feel like it. I’ve been running for just short of a year now which means almost all four seasons. Running in the heat of the summer makes me long for the days of cold wind and black ice. Winter running makes me look forward to blistering heat, sunburn (and most of all the joy of jumping in the pool when I'm done to cool off). It’s all about perspective. Keeping up with it makes all the difference. Rest and recovery days are just as important as training days. I started with running 7 days a week, but quickly found I did much better when I ran no more than 3 days in a row. Balancing out down days with strength training and stretching is awesome. I like to do a little P90x, yoga, and roll on my Arrosti roller in-between my runs. It keeps me tuned. Forget diets - you need fuel to run. It's also important to make it good fuel. Just like I don't fill my car with "regular" gas, I refuse to fill my body with crappy food. My favorite pre-race meal as of late has been raw oysters, and a high carb such as gnocchi or a loaf of fresh baked bread, and a glass of red wine. The veg is also important as a full time supplement. What do bunnies eats? Grass. How to bunnies run? Fast. Enough said. It took me a while to figure this out, but there’s a lot to be gained from running a slower pace. Be the bunny, but be the turtle too. Turtles eat weeds and they’ve got lots of endurance to go the long haul. Run slow to run long.Keeping a steady pace is way more beneficial than using up all that speed at the start. I like to run races from the middle to the back of the pack. That way I can set my sights on a few people and give myself mini goals along the way to "pick them off" as I run. With each pass I find myslef motivated to keep ahead. Granted others have the same goal and it can start a giant game of leapfrog on the course, but that's distraction from the task at hand, and for me - a real plus! I love running. I love the challenge. What's up next? 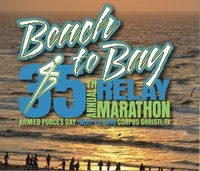 The Corpus Christi Beach to Bay Marathon Relay and I can't wait!!! 26.2 miles - 6 person team = fun fun fun! 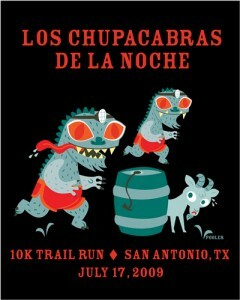 If we can finish this one, perhaps I can convince enough people to join me on the Capitol to Alamo relay? 143 miles from the state Capitol in Austin to the Alamo. I want to run! Thanks for posting this! I'm bookmarking all kinds of stuff!